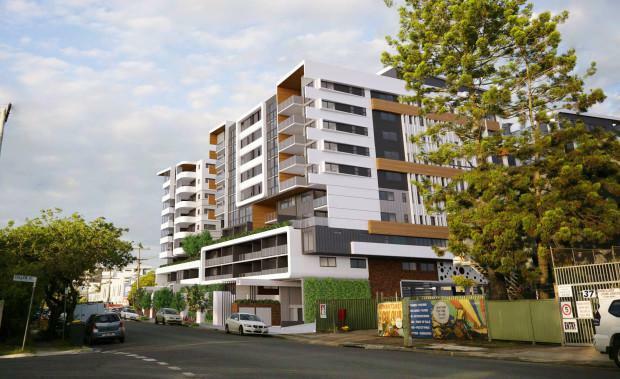 A Development Application has been submitted for a mixed-use development at Windsor in Brisbane's inner north. The project at 120-124 Lutwyche Road includes apartments, a hotel, office and retail space. It consists of three towers. The first is 11 storeys of purely residential accommodation consisting of 116 one and two-bedroom apartments. The second tower is 10 storeys with a 121-room hotel and includes a rooftop restaurant, bar, pool and function room. According to the proposal, the hotel is designed to provide short-term accommodation for patients and families of the nearby Royal Brisbane and Women’s Hospital. The third tower is 10 storeys and is also residential, consisting of 55 apartments, mainly one and two bedroom, with one three bedroom. Designed by Sparc Architecture, the development currently houses industrial warehouses on a 3,833 sqm site.